Take a ride through 26 fully illustrated search and find spreads, each one themed on a number. Count the animals going into Noah’s Ark two-by-two, spot 13 scary skeletons at the haunted house on Halloween, and visit Farm Fifteen where everything from one scarecrow through to 15 apples need to be found. 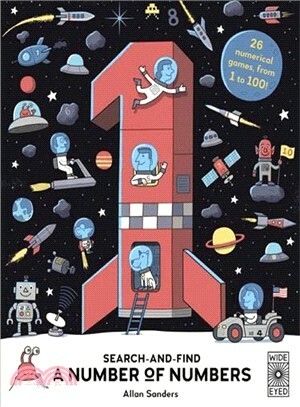 Allan Sanders’ weird and wonderful drawings are packed full of funny things to spot and plenty of Where’s Waldo style humor, making this the best way to learn your 1, 2, 3s . . .
AMANDA WOOD began her career in illustration at the Natural History Museum, London, and went on to be the founding Editor and Publisher of Templar for more than 30 years. In her time there, she published and nurtured numerous Greenaway winners, and edited and wrote groundbreaking series such as The Ologies, which have sold over 19 million-copies worldwide. Today she writes and runs her own small press from her home in Surrey.